Q1: What is an eSign? eSign stands for electronic signature. It is a paperless mode of signing documents online. eSign Electronic Signature Service enables any Aadhaar-holder to electronically sign documents using Aadhaar eKYC services. eSign Application Service Providers (ASP) like us, SignDesk.com, integrate with this service to facilitate Aadhaar-holders with a way to sign documents electronically. By using eSign service, availing of Digital Signature Certificate (DSC) and affixing of eSign will be done within seconds. Q2: Who can use eSign? Anybody with an Aadhaar number and a mobile registered with Aadhaar can use eSign to sign documents online from any remote place. Q3: Is eSign legally valid? Yes. eSign is legally valid and it is a recognized form of signature under the provisions of Information Technology Act, 2000. Q4: What are the provisions of law related to eSign? Section 2(t)(a) of Information Technology Act, 2000, confirms the usage of eSign while Section III of the Act provides for authentication of electronic records. The Government of India through a notification in The Gazette of India, Extraordinary, Part II, Section III, dated January 28th, 2015, has recognised the usage of eSign. Q5: How does eSign help? eSign helps you to sign a document at your convenience and all you need is a 12-digit Aadhaar number and a mobile registered with it. If two parties entering into an agreement have Aadhaar number and Aadhaar-registered mobile numbers, then it is possible for both the parties to sign the document online without being physically present. Besides being reliable, using eSign service helps you save time and cost. Since eSign involves paperless transaction, you can also contribute your bit in saving trees. Q6: Where can an eSign be used? a will as defined in clause (h) of section 2 of the Indian Succession Act, 1925, including any other testamentary disposition by whatever name called. Q7: Is SignDesk.com authorised to provide eSign service? SignDesk.com is a duly recognized entity authorized to provide eSign services. Signdesk.com is an ASP (Application Service Provider), duly registered with CDAC (ESP) and in collaboration with the UIDAI, for providing services facilitating eSign. 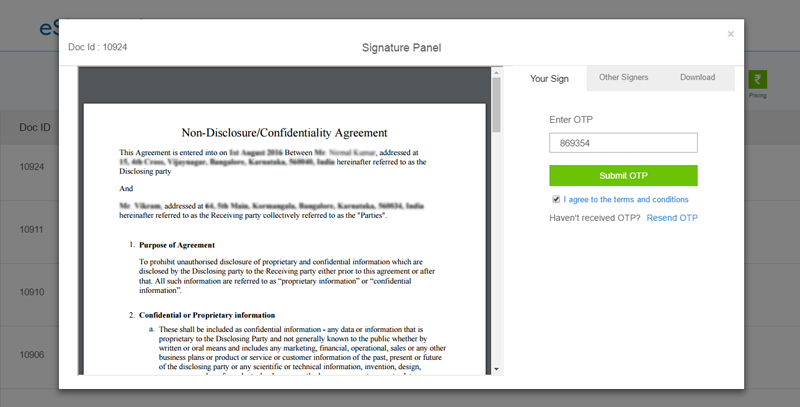 In the eSign process, the user (signer) receives OTP from UIDAI and when the OTP is entered the document is verified. Q8: How to validate an eSign? Download the document and open it with Adobe Reader. Click on Signature Panel at the top or the eSign appearance. When ‘Signature Validation Status’ opens, click ‘Signature Properties’. You will next see ‘Import Contact Settings’ window. Check (Tick) the boxes provided before Certified documents and the three other options that follow it. And click ‘OK’ to continue. Now your eSign is complete. Your eSign will have a Green Tick mark which means it is legally valid. Q9: How does an eSign look like? Q10: Which documents cannot be signed using eSign? (a) a negotiable instrument as defined in section 13 of the Negotiable Instruments Act, 1881. (b) a power-of-attorney as defined in section 1A of the Powers-of-Attorney Act, 1882. (c) a trust as defined in section 3 of the Indian Trusts Act, 1882. (d) a will as defined in clause (h) of section 2 of the Indian Succession Act, 1925, including any other testamentary disposition by whatever name called. (e) any contract for the sale or conveyance of immovable property or any interest in such property. Q11: What should I do if I don’t receive an OTP? Once you click ‘Get OTP’ button, you will have to make sure that your Aadhaar-registered mobile number is active and is within its network coverage area. In case you still don’t receive the OTP even 3 minutes after clicking the button, then click on ‘Resend OTP’ button. But if you do not receive OTP even after clicking Resend OTP, it means that there could be some delay caused in fetching your data from Aadhaar database. You will see an error asking you to try again later. 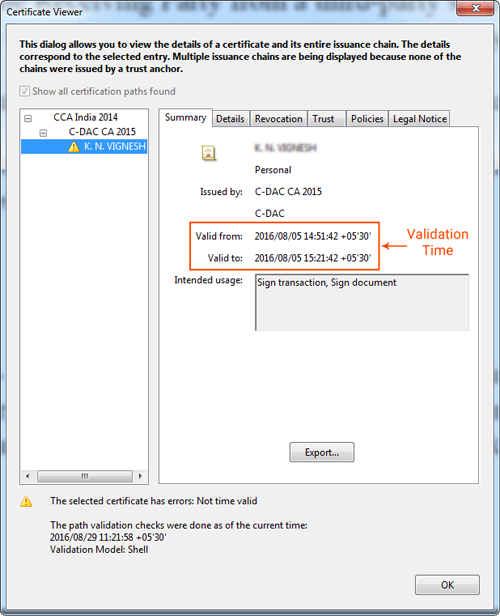 Q12: Why does the certificate show only 30 min validity? The Digital Signature Certificate issued to your Aadhaar-based eSign expires in 30 minutes. After 30 min, the private key is destroyed to avoid any misuse, thus making it more secure. Q13: How long is an eSign valid? Though the DSC expires in 30 minutes, your eSign affixed on a document will be valid forever. The private key associated with your Signature Certificate is destroyed in order to avoid misuse. Q14: How to upload a document? Click “Upload Document” button on the top right of dashboard or on SignDesk homepage. Provide a name to your document that you are uploading and click Upload. Browse and select a file from and that’s it. Your file will be uploaded and you will see a preview of it in the Signauture Panel. Q15: What is a Certifying Authority (CA)? A Certifying Authority is a trusted entity which issues Digital Signature Certificate, which is a essential part in the eSign service. Section 84 of IT Act 2000, describes CA as a licensed-holder to issue DSCs. i need to sign patent related doc ,class 3 sign ,i require ,what is cost of it. Dear Vilas, at present, we do not cater to Class 3 digital signatures. Does the e-sign process include the payment for stamp-duty? How does this process work if the document needs to be stamped/franked? No Dinesh, eSign cost is not inclusive of stamp duty. The usual ways of payment of stamp duty will remain the same, just instead of hand signature, you can opt for eSign. Dear Dinesh, eSign payment does not include stamp duty. You can either purchase eSign in single or in packages as per your requirement. We also offer API for businesses/firms. gud morng. what is the difference between class 2 and class 3 dsc for an individual. & which is necessary for incometax and gst. thanks. How to add my signature in my application PDF format ?? Then upload a pdf & enter your Aadhaar details in the space provided. You will receive OTP on the mobile which you will have to enter and then make the payment. That’s it. Your PDF will be eSigned and it will be available for download. Your e-KYC based request has failed hence you cannot proceed the application with e-KYC mode. Kindly generate new token and proceed with physical mode. Kindly note that you will get refund of the PAN application in next seven working days. Hi Mr. Rashid, you didn’t mention when you got this message and on which portal. i also receive same message on this site https://www.onlineservices……..
and i already done payment of 117. through net banking on 21/02/2017. and it says you will refund in seven days. i dnt knw what is the reason for it. Since it is not related to our website we cannot provide any help. You have to check with them. Class 2 and class 3 dsc is prescribed for Invoice signing under Service Tax. Whether signing through eSign Desk is in compliance of the law? Also, whether eSign Desk is integrated with SAP ERP? Hi Manoj, eSign is equivalent to Class 2 signature and it is legally compliant too. But you will have to check with the service tax dept. about its usage in invoice signing. Dear Paras, the eSign cannot be considered as a substitute of DSC. Kindly find out with the IT Dept. about its usage in filing tax returns. And eSign cannot be stored on a pen drive, only the eSigned documents can be stored. Can I enroll new Adhaar Card for others using my e-Sign? By looking at signed PDF, can you find out specific person who signed it digitally? For example there are 1000 Srikanth in India, can you help me understand? Hi Srikanth, Aadhaar enrolled full name will be displayed in your eSign on a PDF. There would be a unique private key generated for every esign. and associated details such as address, age, DOB etc. can also be traced. I applied for PAN Card thrice through online and in the last step where Aadhar gets verified through e-KYC Sign. the message said: “E-KYC Sign cannot proceed further and your money will get refunded within 7 working days. What does it mean?? Please reply ASAP! Hi Dolly, seems you have received this message on some other website while applying for PAN. You should try contacting that website’s team member by calling or sending an email to know why you got this message. Hi Sanjeev, our tech team representative will call you and help you out. May I use this E sign for Income Tax E Filling & GST Purpose..? As of now, the Centre or the income tax dept has not announced about the acceptance of eSign for tax filing purposes. You may have to check with the income tax dept to know the same. I was trying to link my Pan with Aadhar. During the long process I was asked pay online Rs 112 which I did to authenticate e-kyc confirmation from Aadhar. I received a OTP which I confirmed. I also received a confirmatory email from Aadhar that my e-kyc was successful. But I received the following message from NSDL “Your e-Sign/e-KYC based request has failed hence you cannot proceed the application with e-KYC mode. Kindly generate new token and proceed with physical mode or e-Sign mode. Kindly note that you will get refund of this PAN application in next seven working days.” How to resolve this? My e-sign failed for verify aadhaar,during pan card apply.What should I do now? My pan says… PAN Application digitally signed, not valid unless physically signed…. What should I do?.. Do I need to sign on the signature box.